Welcome to Mountain Hydeaway! 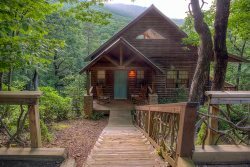 The perfect vacation cabin rental with outstanding views of Yonah Mountain from your covered outdoor hot tub, or your spacious deck with Adirondack seating . . . a wonderfully private setting for rest and relaxation, surrounded in lush Mountain Laurel. Mountain Hydeaway is a beautifully furnished elegantly rustic cabin with room to stretch out, relax, play and rest. When you're ready to adventure out, Serenity Cellars vineyard and tasting room is at the bottom of the paved mountain road, offering live entertainment on many weekends. The alpine village of Helen and historic Sautee Nacoochee are also closeby to this centrally located cabin off Duncan Bridge Rd. If you do find that burst of energy, horseback riding or one of our many local ZipLine tours are great options. Or just relax and schedule an evening carriage ride down beautiful Lynch Mountain Road in Sautee. This rustic and upscale 2 bedroom cabin, is perfect for 2 couples, or up to 6 in your family (futon sleeping for 2 children on lower level). Included are all the amenities needed for a mountain getaway. 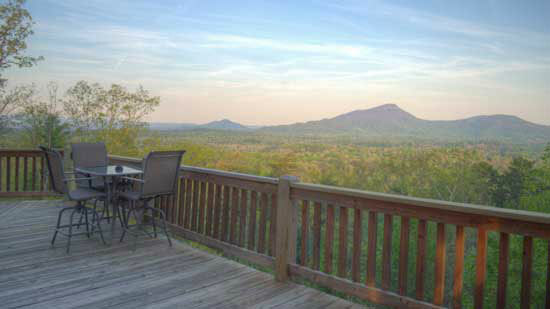 Soak your body in the perfectly located covered hot tub as you gaze at the mountain ridge of Yonah Mountain. Or step inside and enjoy the warm fireplace in a rustic atmosphere and simply relax. If visiting some of our excellent local wineries is on your list, in addition to Serenity Cellars, Yonah Mountain Vineyards and their incredible new facility is a mere 3 miles from Mountain Hydeaway, and CeNita Vineyards is just beyond and about 4 miles away. Whatever your interest, Mountain Hydeaway is the perfect home base for all your adventures. We loved the cabin and the location! We felt secluded enough to enough some privacy, but actually close to all the activities we wanted to enjoy! The cabin was very clean and spacious. The kitchen had everything we needed, and more! We will definitely be back! We had to call in because the pilot light was not lit for the fire place. The rep was very helpful over the phone and said he would have someone out the next day. We left to go out and when we returned it had been handled. We had the best time! So peaceful, so relaxing! It was exactly what our family needed. Can't wait to go back! I didn't really have to deal with them very much, everything went very smoothly and there were no issues. Our stay was very nice and relaxing just we needed for our little family. Looking forward to doing it again. Very friendly staff and a good website with helpful information. We really enjoyed our time at your cabin. I'm excited to come back one day and use your rental company. You have a lot of other cabins we would love to stay at in the future. Good location for the one we stayed at. Getting to Helen and back was quick and easy. We lied the style of the cabin, it's exactly the kind of style and feel we like when going to the mountains. Thank you! Very easy and great communication. Absolutely loved this cabin. Secluded, quiet, and beautiful views made it a perfect place to unwind and relax. Loved that it felt like you were away from it all but were still a short drive to "civilization". The cabin was very clean and well maintained - towels were probably the softest I've ever experienced at a vacation rental and the beds were extremely comfy. We stayed at Mountain Hydeaway and simply loved the location, view, and cabin amenities. Very good value with lots of nearby activities with the option to stay in and rest if wanted. We will definitely be back to catch some R and R later. Working with team members was a breeze. Ashley was very nice and thorough. Natalie was quick and prompt in her correspondance. I really enjoyed staying at Moutain Hydeaway. Cabin was so clean and well maintaned.I Loved the privacy! I loved everthing about my stay. From the booking process to checkout. The cabin was so comfortable and cozy. My expectations were exceeded for my weekend getaway for some much needed rest and relaxation. Thanks Pinnacle. Keep up the Great work! It was a very good location and the property was very nice. The property was perfect for our needs -- secluded, nice views, and well decorated and maintained. We were the perfect distance from town, and the cabin was great for our family of four! The cabin was very clean and had everything we needed. The decor was expertly done and added a lot to enjoying the space. The bed was very comfortable and had nice soft sheets. This was a wonderful cabin rental to stay in for 3 nights. Great views, clean and maintained hot tub, fun location close to downtown Helen and lots of nearby little hikes and parks. Highly recommend!